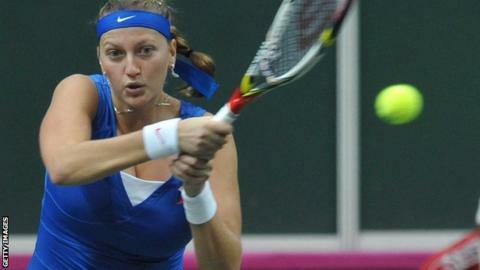 Petra Kvitova helped the Czech Republic take a 2-0 lead over Serbia in the Fed Cup final in Prague. The 2011 Wimbledon champion beat Jelena Jankovic 6-4 6-1 following Lucie Safarova's straight-sets win over Ana Ivanovic. Kvitova shook off the stomach virus that forced her to withdraw from the WTA Championships to defeat Jankovic in 80 minutes. Her victory puts the Czechs within one win of retaining the Fed Cup. "I did not know what to expect at the beginning," said Kvitova. "I had a little trouble breathing, towards the end my legs were weakening and I had a headache, so I wished for the game to be over. "Jankovic played very well at the beginning, I knew I had to wait for her mistakes. I did not try to go for it from the start, not to make mistakes myself." Earlier, Safarova took one hour and 41 minutes to complete her 6-4 6-3 victory over Ivanovic, who must beat Kvitova on Sunday morning to retain Serbia's hopes of winning the Cup. The Czech Republic's men face Spain in the Davis Cup final in two weeks' time.